Sanyo announced the addition of a new model to the eneloop bike lineup, the CY-SPK227 electric hybrid bicycle, to be launched in Japan. The Sanyo CY-SPK227 electric hybrid bicycle is the world's first commercially available power-assisted bicycle with a carbon composite frame. Due to its properties, carbon composite is a material that facilitates the optimal design of each part of the frame in terms of rigidity and vibration absorption. It enables a comfortable ride and helps efficiently convert human energy into propulsive power. 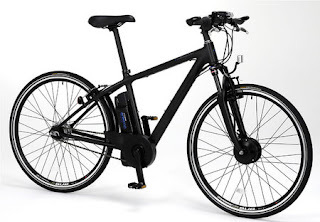 The new Sanyo CY-SPK227 electric hybrid bicycle features Two-Wheel Drive System- where conventional pedal power is applied to the rear wheel, while an electric motor powers the front wheel. As a result, both the front and rear wheels grip the road securely, thereby increasing a stable feeling while riding, and providing a smooth ride with forward traction that is very steady and straight. The CY-SPK227 is equipped with a Sports Traction Mode. The mode improves the ridability so that when the rider puts pressure on the pedal even if the wheel is slipping, the mode detects this and causes the front-wheel motor to rotate and grab the road. Rather than increasing the battery capacity to meet the need for traveling longer distances, Sanyo developed the Loop Charge Function as its exclusive technology for generating and storing energy during bicycle operation. The Loop Charge Function System generates electricity by switching the motor to a dynamo and charges the hybrid bicycle's battery during riding (regenerative charging).Other features include- 3 high intensity LED’s battery light, Central Controller (equipped with back light) indicating various operating information on its liquid crystal display in real time and Magnesium Suspension Fork to further increase the ridability under various road conditions.Sanyo CY-SPK227 electric hybrid bicycle will be available only in Japan from October 1st for approximately 627,900 yen (Ouch!). That's pretty cool. I'd like to see more electric bikes in Los Angeles. I read recently that Sanyo will begin shipping parts for hybrid bicycles to Europe in 2010. Maybe North America isn't too far away?